All 1/2, 1, and 2 ton models are H4 rated and built almost entirely from stainless steel. What does that mean? The drum, plates, fasteners, bottom block, motors, gearbox, and enclosures (when electric powered) are stainless. The stainless gearbox is fully sealed with Food Grade Oil bath lubrication. These can run from an electric or air power source. David Round can engineer a custom cleanroom hoist to meet your exact needs. Don’t think a stainless wire rope hoist is the best solution for your application? 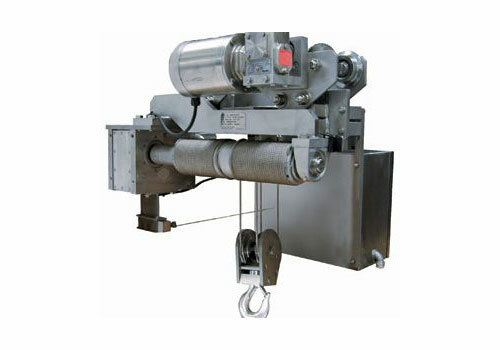 See our other stainless hoist options below.